Help the Humor Times survive in a tough environment for independent press outlets! The Humor Times is a website, sure, but we’re also a monthly print magazine (available worldwide, in digital or print form), and … Read moreMake American Satire Great Again: Support the Humor Times! Support Great Political Satire! Become a Patron of the Humor Times via Patreon! Become a Sustaining Supporter on Patreon.com, get rewarded! Politics can be depressing, especially when it seems our so-called “leaders” are completely out of touch with average people. But high-quality political satire can help our nation … Read moreSupport Great Political Satire! Become a Patron of the Humor Times via Patreon! 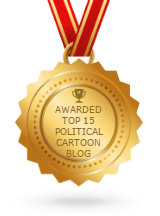 Now available on the Humor Times “News in Cartoons” free app, the latest edition: The ‘Stable Genius!’ You’d be “like, really smart” to get it! In the latest edition of the News in Cartoons Humor … Read more“Like, Really Smart, and the Stablest Ever!” – Latest Edition of the Humor Times Free App!